This feature is available from v4.01 onwards. 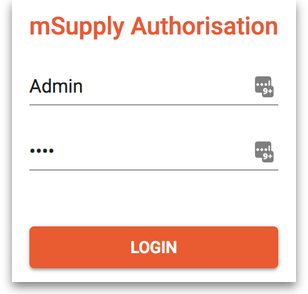 mSupply's authorisation functionality can be used to make sure that goods are not distributed to customers or receipted into stock until the action has been authorised. Using the remote authorisation module allows both mSupply and non-mSupply users to authorise transactions without using mSupply. Authorisers receive an email anytime authorisation is requested. The email will contain a link to the authorisation web app, which will display all pending authorisations and allow authorisers to approve or deny transactions. The transaction can then only be processed once it has been authorised by everybody in the chain. Finally, click on the OK button to close the window and save the preferences. From now on, the transaction types you set the preferences for must be authorised through remote authorisation before being confirmed. The remote authorisation module allows sequential authorisation, where authorisation is requested from users in order of priority. Authorisers will only receive an authorisation request if the transaction was priorly approved by the authoriser(s) with a lower priority level. Priority levels are defined when setting up authorisers. These priority levels can also be set up with an auto-authorise period, where transactions will automatically be authorised if the user has not approved or denied the transaction before the set auto-authorise period is reached. 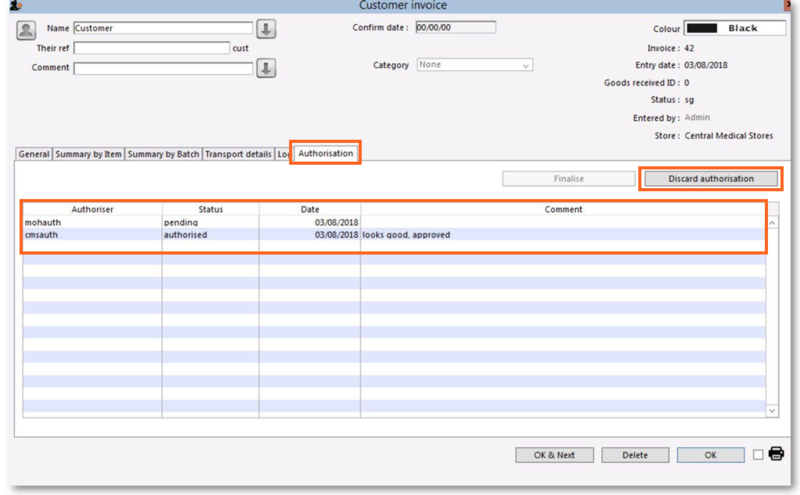 Transactions can be set up to authorise via vertical programs. To do this, each vertical program must be set up with a master list of items. When authorisation is requested, mSupply will go through the transaction to check whether any items in the transaction are associated with a vertical program. If there are any items associated with a single vertical program, users will be asked whether they would like to request authorisation through a vertical program or through the generic method (through no program, the default method). This function will be carried out through the Authoriser Admin window in mSupply in the future. Authorisers can be imported into mSupply using an Excel spreadsheet defining the name of the authoriser, the type of transactions they can authorise, and their priority level. Click on the File > Import > Import authorisers… menu option. Choose the excel file to import. It must have the following headers: Store, Record Type, Username, and Priority. 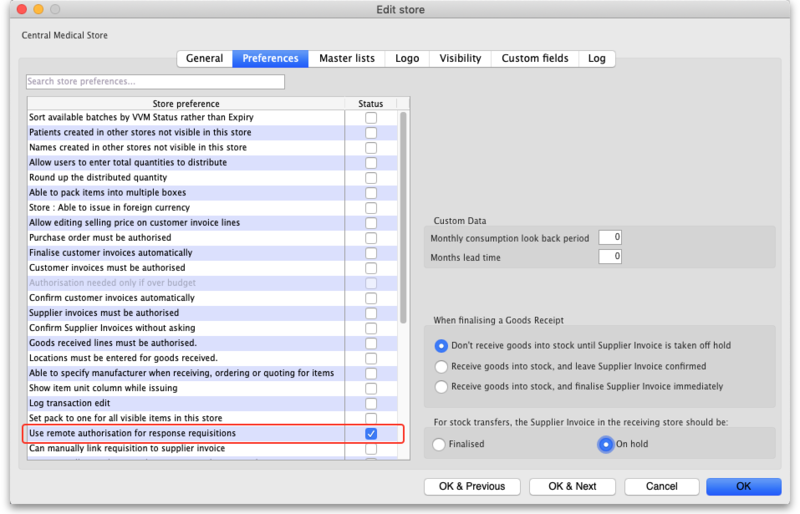 The store code and the username must match an existing Store Code and Username in mSupply. The record type can be any of the following depending on which transaction type the user can authorise: “customerInvoice”, “supplierInvoice”, “requestRequistion”, “responseRequisition”, or “purchaseOrder”. If using Sequential Authorisation, the priority level of the authoriser defines the order in which each authoriser will be asked to authorise the transaction. For instance, an authoriser with priority level 2 will only be requested to authorise a transaction once it has been authorised by an authoriser with priority level 1. If not using sequential authorisation, all authorisers can be given a priority level of 1.
mSupply will show an error if any invalid rows are found in the excel spreadsheet, and no rows will be imported. Click on the File > Export > Export authorisers… menu option. Name the excel file to which you would like to export authorisers. The excel sheet created will list all authorisers, their associated stores and usernames, and their priority level. This spreadsheet can be edited and used to import authorisers. Turning on the remote authorisation preference adds a new tab called 'Authorisation' to the transaction window. The Authorisation tab allows users to request or discard authorisation and displays a list of pending authorisation requests once the transaction is in the authorisation phase. The Request Authorisation button will only be enabled once there is at least one item in the transaction. Once authorisation is requested, the transaction will be locked down and users will not be able to edit. Users can view all pending authorisation requests in the listbox. The Request authorisation button will become the Discard authorisation button. If the transaction needs to be edited, users can Discard Authorisation. This will discard all authorisation requests and unlock the transaction for editing. Discarding authorisation will remove all previously-approved approvals. If you request authorisation again, authorisers will have to re-approve the transaction. Once authorisers approve or deny the transaction through the authorisation web app, the status of the transaction will be updated in the listbox. Once the transaction has been approved by all authorisers, the Finalise button will be enabled. 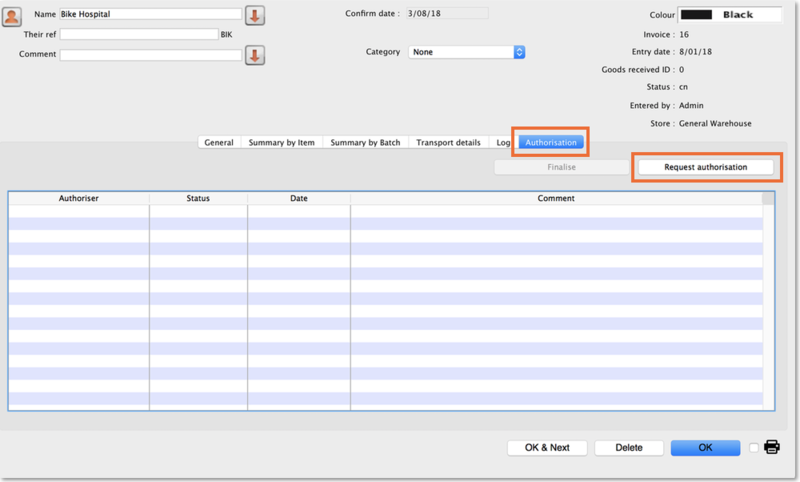 Users can then finalise the invoice by clicking the Finalise button. Authorisers can check, comment on, and approve or deny authorisation requests through the authorisation web app. The Authoriser web app url is in the format server:port/authorisation, for example, https://demo.msupply.org:2048/authorisation. Users can log in using the authoriser username and password defined in mSupply. Once logged into the authorisation web app, users can view, comment on, and approve/deny transactions. To view the transaction as a PDF, click on the download icon of the transaction. The PDF will be opened in a new tab. To comment on a transaction, click the plus icon in the 'Comment' column. This comment will be shown on the authorisation tab of the transaction window in mSupply. To approve or deny transactions, check the 'Selected' column of the transactions to be approved or denied. Click the Deny Selected or Approve Selected button to deny or approve the selected transactions.